Babelcube connects writers with translators. It's easy to use. Just post your profile, upload information about your books, and wait for independent translators to contact you. For authors, there's no cost up front. Babelcube handles all of the details and splits the profits between you, the translator, and of course, they keep a small cut for the house. Commissions are based on how much revenue your books take in. Babelcube takes 15% for brokering the deal. Your split ranges from 30% to 75% depending on how many copies your book sells and the revenue generated. You receive 30% of revenues for sales under $2,000, and 75% for sales over $8,000. Similar to Amazon, they pay sixty days after sales are made. One caveat, your payment needs to be $50.00 or greater to receive a payment for the month. To view the complete royalty schedule follow this link http://www.babelcube.com/faq/revenue-share. 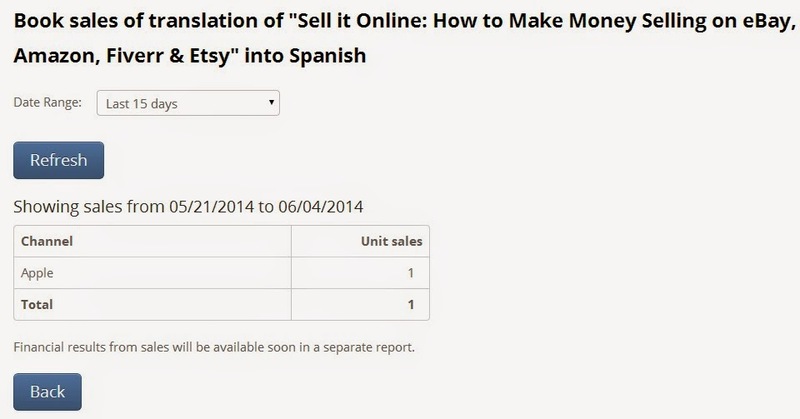 I’ve inked deals to have eight of my eBay books translated into Spanish, Italian, and French by six different translators. My personal thought is Babelcube is a great concept. They recently updated their user interface, but it’s still hard to work with. To get started you need to sign up at http://www.babelcube.com/register/. At the top of your home page, there are four tabs – profile, books, translations, and messages. When you click on Profile, you’re asked to provide all of your contact information. Fill in as much as you can. I posted my Amazon author bio, my picture, and included links to my website. When you click on the Books section, it gives you the option to Add Books. Follow the prompts and add your book details. I copied my book description and most of the other information from my Amazon book page. You can add just one book or your entire catalog. 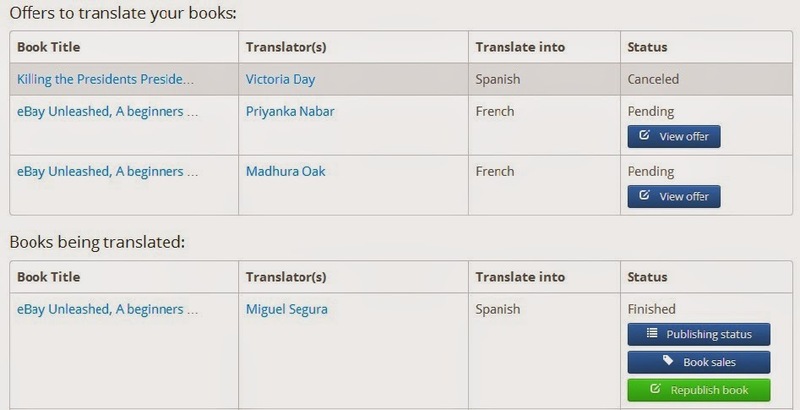 The Translations tab shows what offers you have received to translate your books, and a list of the translations you have in progress. Click on the book title and scroll down to the bottom of the page to get more information about your projects. This section shows a list of translations you have in progress, and names of the translators handling the project. At the bottom of the page there are three tabs – edit book, upload book material, and return. 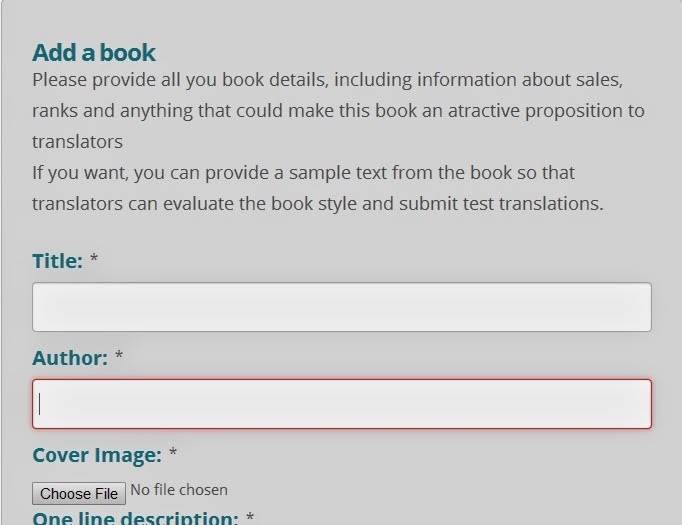 Edit book lets you change your book description or upload a new cover. 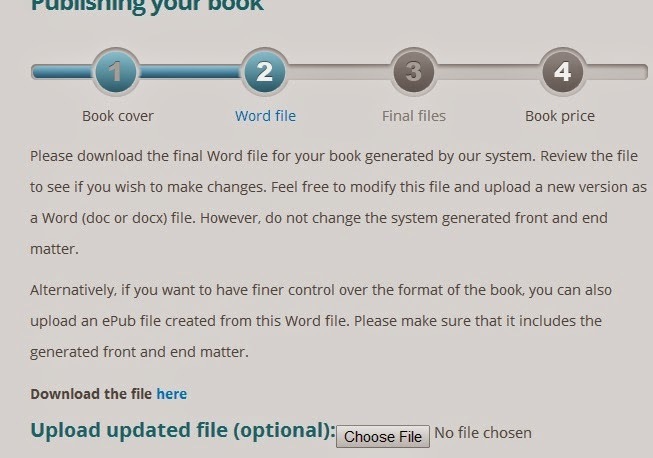 Upload book material lets you upload your book file, book description, and an author biography. 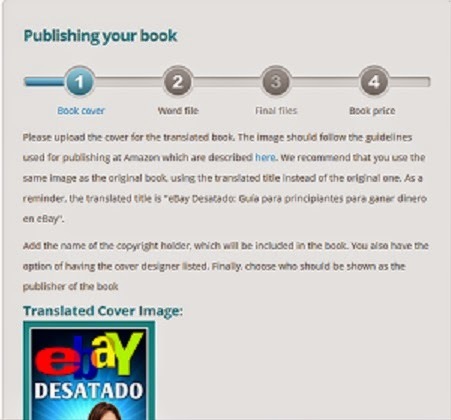 Your translator will also translate your biography and book description when they prepare the book for publication. When you press Return, it takes you back to your profile page. The Messages tab holds all of your correspondence so you can send messages to your translators, and correspond back and forth with people wanting to translate your books. Babelcube will email you when you receive an offer to translate your book. You can check out the offer by logging into your Babelcube account and selecting translations. The translations page is divided into two sections – Offers to translate your books, and books being translated. All of your current offers will be grouped in the offers to translate your book section. Click on the offer details in the status column. It will contain a sample of translated text and information on how soon the translator will complete your project. The first date shown is when you can expect the first ten pages of the project. The second date is the expected completion date when your entire book will be translated. Most of the translators I’ve worked with offer to deliver the first ten pages within five to ten days, and the completed translation within twenty to forty-five days. When you receive the first ten pages look the translation over if you are familiar with the language. If you’re not familiar with the language, ask a friend, a university professor, or someone familiar with the language to give it a once-over to make sure everything sounds ok. If everything is good, click the accept translation button to approve the translation. At this point, I make a note of the title in the translated document and verify with the translator that this is the title they want to go with. After we’ve approved this, I get with my cover designer to have the new cover made. In nine out of ten cases it’s a simple matter of swapping out the title and leaving the basic design the same. You’ll receive another email from Babelcube when the translation is completed. To approve the final translation, return to the translations page. This time you’re going to look for your book in the books being translated section. Click on the Publish tab in the status column, and it will walk you through getting your book set up for publication. 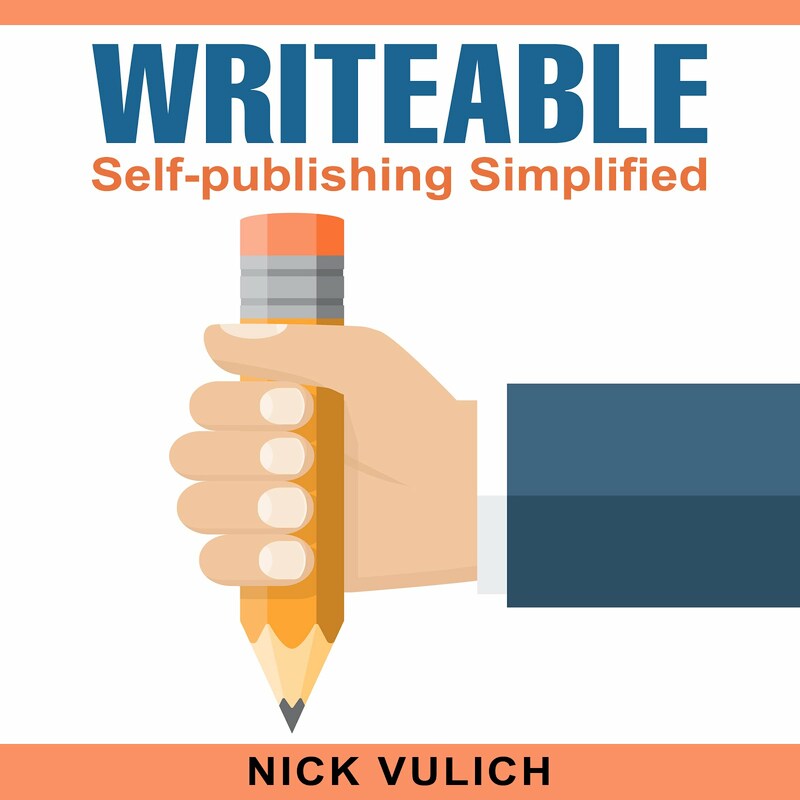 Publishing your book on Babelcube is a four step process that should take less than five minutes. Upload your translated book cover. To upload your new cover click on the choose file box, and select your cover file. Ensure your name, and the name of your cover designer is correct. Check the word file. The translated word file is preloaded into the system by Babelcube. You can download a copy to your computer by selecting here, right after where it says download the file. As long as the first ten pages check out ok, I normally skip reviewing the entire document, and just assume everything is ok. If you make changes to the file, upload the revised document where it allows you to choose the new file to upload. Select next step at the bottom of the page to proceed to the next section. Review the final document. Check the I have reviewed this manuscript box to approve the document, and select next step to proceed to the final section. Set your book price. Babelcube lets you set the price of your book between 99¢ and $39.99. For best results, they suggest you price your book between $2.99 and $9.99, which is in line with Amazon’s sweet spot for pricing. At this point, your book is set to go and should start publishing to Babelcube’s partner sites within a few days. In my experience your books will show up on Kobo first, then Barnes and Noble. Amazon is normally the last site your book will show up on. Apple is iffy at best. If you want your books to show up in the iStore, you need to prepare your manuscript properly before you forward it to your translator. Remove all links to books on other book sites such as Amazon and Barnes & Noble. Make sure not to refer readers to check out any books on competing retailer websites, and if you ask readers to leave a review when they are finished reading, remove any references to specific book sites. If there are any complications, Babelcube will email to let you know that changes to your manuscript are required. Trust me it’s easier to take care of these details when the manuscript is in your native language. I’ve had to look for problem areas in two translated documents, and it’s time not fun. FYI: If you need to make changes, download a copy of the document in step two of the publish process. Make any necessary changes, then upload the new file where it says upload file in this step. Continue through the publishing process to complete your changes. If you decide you want to change your prices go to the translations page, select republish translation and go to step three. Enter your new price, and continue to the next step to publish your document. Final thoughts. I currently have four books published through Babelcube. I have four more translations in the process. Not everything has gone smoothly. I had once translator working on three projects skip out on me, a few translators have missed their deadline by a day or two, but otherwise I think Babelcube is a decent site. Their customer service is top notch, and they normally answer questions within twenty-four hours. For authors, there is very little downside. You can reach an entirely new audience with very little risk. Your only outlay is for a new cover, and that can be as little as five dollars if you use a designer from Fiverr. Babelcube did just recently add a sales dashboard so you can check your sales results. To go to it, you need to visit your translations tab. To the far right of each book, you will see three tabs. Choose book sales to see your results. Babelcube has been growing quickly, and they appear to be adding new selections to the website every few weeks. Over time they could become a major force in e-publishing. Thanks for this very thorough article. Babelcube provides a great service but they really should do something about the table of contents issue (many books have 2 TOCs, sometimes poorly formatted). This gives an unprofessional look to the books.